The more we as marketers take on sophisticated challenges with our content, like personalizing at scale, the more we need to work with technical specialists. Three such roles I kept hearing about at the Intelligent Content Conference are content strategists, content engineers, and data scientists. Together, these “three amigos of content marketing,” as content engineer Cruce Saunders refers to them, provide a power boost that can improve the efficiency and effectiveness of content marketing. Let’s look at these roles and how marketers might work with them. As senior director of content strategy in global health sciences at The Medicines Company, Buddy Scalera characterizes his role as a “strategic superconnector.” By this, he means that the content strategist works with people across creative and technical teams to plan, create, deliver, and govern content assets across channels, audiences, purposes, and departments. Superconnector. That sums it up. Large organizations with complex content strategies need individuals or teams dedicated to content strategy. Small organizations may require that people in other roles (marketers, for example, or brand managers, project managers, managing editors, or administrative assistants) integrate content strategy into their jobs. Buddy suggests that marketers align their commitment to brand messaging with the content strategist’s commitment to meeting business goals. This may seem obvious, but in Buddy’s experience, it needs to be said: Be willing to abandon brand messages that don’t convert people and to focus energy on content that supports business goals. Buddy also recommends that marketers invite the content strategist’s ideas for alternatives to proxy measurements (vanity metrics): page views, likes, PDF downloads, etc. Those metrics not only fail to tell you whether your content is helping you meet your business goals, they can also mislead you. For example, unless you’re paying attention, you might put a retweet that slams your company into the win column. What Should Marketers Look for in a Content Strategist? Do you plan to automate and personalize your content over multiple channels? Do you want to create advanced content-related tools, like chatbots or intelligent search engines? If so, in addition to working with a content strategist, you need to get tight with a content engineer. If you’re lucky enough to have a content engineer to work with, immerse that person in your planning. As Buddy’s content engineer colleague Matt Balogh says, convey “the dream” of what you’d like to accomplish, and let the content engineer pull you back to what’s possible. Cruce urges marketers to treat content engineers as partners in planning. Help them understand why you’re doing what you’re doing with content. Don’t think of them just as systems builders. Collaborate with them on what your systems should be. Err on the side of over-communicating and over-planning. As Matt says, this kind of collaboration “is more complex than you realize” and “always takes longer than you think.” His motto is “Weeks of coding save hours of planning” ­– his tongue-in-cheek way of saying that seemingly small changes may take weeks to fix in the code, so plan with care. Most marketers probably won’t work directly with data scientists, Buddy suspects. Those marketers who do need to help the scientists get all the content-related raw data they might need, including these examples that Cruce lists: session data, CRM data, SEM data, organic-search data, CMS data, customer segments, and email data. Data scientists tend to be more motivated … when more is expected of them …. If executives make it clear that simple reports are not enough, data scientists will devote more effort to advanced analytics …. By creating solutions that work, they can have more impact and leave their marks as pioneers of their profession. Are any of you marketers out there working with data scientists? If so, I’d like to hear your suggestions in the comments. Here’s what you lose when your marketing team has no one playing content strategist, content engineer, or data scientist. With no one playing content strategist (either as a dedicated role or as part of another role), you make decisions with incomplete information. You create content without fully thinking through why and for whom. You get less bang for your marketing buck. Your content assets are not optimally targeted. Your team lacks cohesion. And your customers and potential customers don’t get the content they need. With no one playing content engineer, you rely on IT techs or web developers for their content system needs. While these techy colleagues have expertise in systems development and networking, they rarely have the skills needed to maximize your content reach, design effective multichannel distribution, implement personalization, or automate content in other strategic ways. Your content is likely to remain unstructured, up for grabs for copying and pasting. In that case, the content can show up anywhere and everywhere, creating inconsistency, resisting governance, and making maintenance impossible. With no one playing data scientist, you can’t draw conclusions from the ocean of potentially useful data at your disposal. You can’t use that data to drive action. You can’t cut through the noise to aggregate data into one warehouse and one set of dashboards. You can’t identify critical trends. You can neither see nor interpret audience behavior patterns that could reveal opportunities for improvement across the sales funnel. 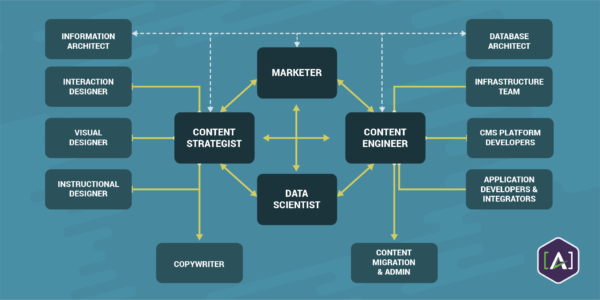 If you’re part of a marketing group that includes content strategists, content engineers, and data scientists, you have a powerful core from which to collaborate with many other content professionals, as shown here. Data science informs the engineering and strategy, further improving the measures. These practices are never finished. They continually work together to improve customer experience and return on content assets. If your organization is looking to fill these roles, Cruce says to look within for people who have some of the skills – especially for the strategy and engineering roles – and train them. Here are his thoughts on each role. Content strategists often start as digital project managers, content marketers, copy directors, or managing editors. Content engineers, so far, are a rare breed. They often start out as business analysts, semantic technologists, technical communicators, CMS-platform integrators, or senior web developers. Many organizations already house the needed content engineering skills; the task is to identify, train, empower, and coordinate the people who have those skills. Data scientists are increasingly in demand. Look for those who have experience with machine learning and predictive analytics. 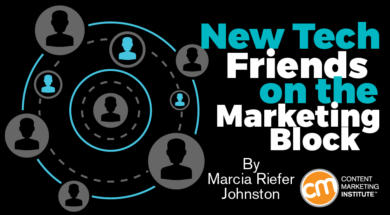 Are you considering adding these technical specialists to your marketing team? Cruce says that bringing these roles together is like joining the left and right sides of the brain. The collaborations are complex and time-consuming. They require mutual respect, exceptional communication, and a commitment to working toward a common goal. How is your marketing team working with people in these techy roles? Help blaze trails for your fellow marketers by sharing your experience in a comment.